Dr. Bill Busch has been in private practice since 1991. His team at North Kansas City Dental Group provides the most comprehensive and advanced dental care available today. 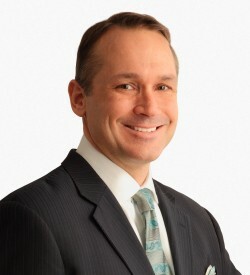 Dr. Busch graduated in 1989 from Fairleigh Dickinson University College of Dental Medicine in Hackensack, New Jersey. Upon graduation, he completed a one-year residency training program in Advanced Education in Dentistry at the VA Medical Center in Topeka, Kansas. He was awarded the Procter & Gamble Award for Excellence in Periodontology. He has been listed in the Consumer’s Research Council of America’s Top Dentists on numerous occasions. In 2009, Dr. Busch was one of only one hundred-fifty dentists around the country to achieve Mastership in the Academy of General Dentistry. This award symbolizes Dr. Busch’s lifelong pursuit of continuing education to provide the highest quality of dental care to his patients. Dedication to staying on top of advances in dentistry drives Dr. Busch to complete at least one hundred-fifty hours of continuing education each year. Throughout the past decade, he has attended numerous clinical training courses at the Las Vegas Institute (LVI) for Advanced Dental Studies, The Pankey Institute, and The Rosenthal Institute. Dr. Busch speaks nationally on the subjects of digital radiography, patient multi-media and other high-tech dental topics. His work and articles are often featured in leading dental trade publications such as ADA News, Dental Products Report, Dentistry Today, and The Computerized Dentist. His work has been seen on The Dr. Phil Show. Dr. Busch is a member of many prestigious organizations, including The American Dental Association, The Academy of General Dentistry, The Academy of Cosmetic Dentistry, The Academy of Sports Dentistry and The Greater Kansas City Dental Society. Dr. Busch serves on 3M’s Dental Advisory Board and is Chairman of the Customer Advisory Panel for Henry Schein Dental, a Fortune 500 company and one of the leading dental suppliers in the world. Dr. Busch’s passion for dentistry and desire to give back to his community inspired him to create and co-found TeamSmile, a non-profit organization in which dental professionals and pro-athletes team up to provide free, top-notch dental care to underserved children in the Kansas City area and around the country. Since its inception in 2005, TeamSmile has helped thousands of children across the U.S. Dr. Busch and TeamSmile have been featured on NBC Nightly News with Brian Williams in the “Making a Difference” segment. You can learn more about Dr. Busch and his practice by visiting drbusch.com.